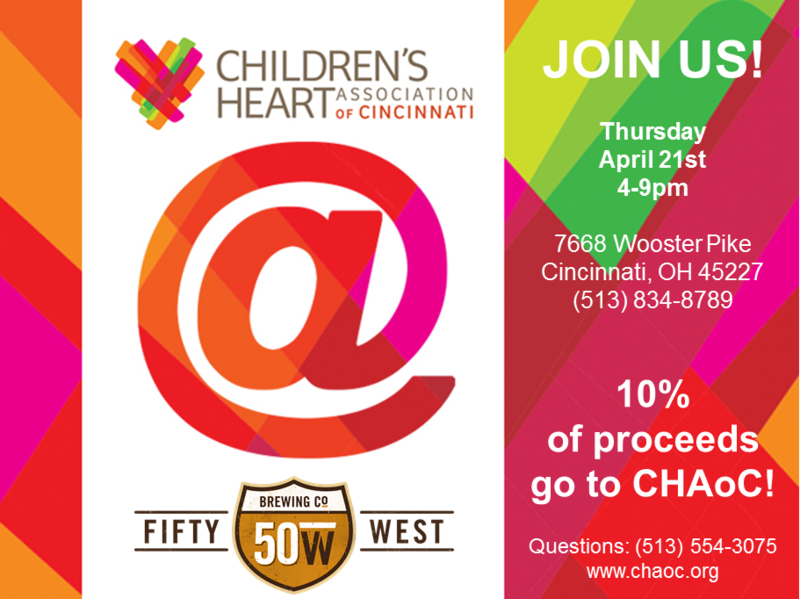 Children’s Heart Association of Cincinnati is pleased to announce that we have been chosen by Fifty West Brewing Company to be their Share the Road charity for April! Enjoy a night out with good friends, tasty food and beer brewed in house on Thursday, April 21st from 4-9pm at the Fifty West Brewing Company, located at 7668 Wooster Pike. Thursday is also trivia night at Fifty West Brewing Company! 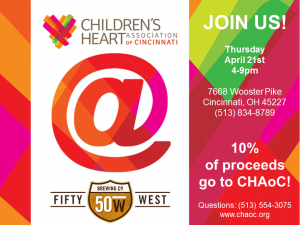 CHAoC is extremely grateful to have the opportunity to partner with local community businesses, like Fifty West Brewing Company, to help raise awareness of congenital heart disease and raise money to support the CHAoC mission. 10% of their proceeds that evening will be donated to CHAoC. Please note this date was changed from the original date announce of February 18th.